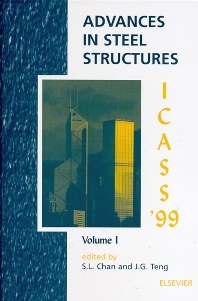 These two volumes of proceedings contain 9 invited keynote papers and 126 contributed papers to be presented at the Second International Conference on Advances in Steel Structures held on 15-17 December 1999 in Hong Kong. The conference is a sequel to the International Conference on Advances in Steel Structures held in Hong Kong in December 1996. The conference will provide a forum for discussion and dissemination by researchers and designers of recent advances in the analysis, behaviour, design and construction of steel structures. The papers to be presented at the conference cover a wide spectrum of topics and were contributed from over 15 countries around the world. They report the current state-of-the art and point to future directions of structural steel research. For engineers, researchers and designers specialising in advances in the analysis, behaviour design and construction of steel structures. Chapter headings and selected papers: Volume I. Preface. International scientific committee. Local advisory committee. Local organising committee. Keynote Papers. A cumulative damage model for the analysis of steel frames under seismic actions (Z.-Y. Shen). Ductility issues in thin-walled steel structures (T. Usami et al.). A unified principle of multiples for lateral deflection, buckling and vibration of multi-storey, multi-bay, sway frames (W.P. Howson, F.W. Williams). Beams and Columns. Chaotic belt phenomena in nonlinear elastic beam (Z. Nianmei et al.). Frames and Trusses. Investigation of rotational characteristics of column bases of steel portal frames (T.C.H. Liu, L.J. Morris). Second-order plastic analysis of steel frames (P.P.-T. Chui, S.-L. Chan). Space Structures. Experimental study on full-sized models of arched corrugated metal roof (L. Xiliang et al.). Connections. The design of pins in steel structures (R.Q. Bridge). Threaded bar compression stiffening for moment connections (T.F. Nip, J.O. Surtees). Behaviour of T-end plate connections to RHS. Part I: experimental investigation (M. Saidani et al.). The behaviour of T-end plate connections to SHS. Part II: a numerical model (J.N. Karadelis et al.). Cold-Formed Steel. Section moment capacity of cold-formed unlipped channels (B. Young, G.J. Hancock). Composite Construction. Flexural strength for negative bending and vertical shear strength of composite steel slag-concrete beams (Q.-L. Wang et al.). Strength and ductility of hollow circular steel columns filled with fibre reinforced concrete (G. Campione et al.). Effects of loading conditions on behaviour of semi-rigid beam-to-column composite connections (Y.L. Wong et al.). Bridges. Structural performance measurement and design parameter validation for Kap Shui Mun cable-stayed bridge (C.K. Lau et al.). Stability analysis of curved cable-stayed bridges (Y.-C. Wang et al.). Seismic analysis of isolated steel highway bridge (X.-S. Li, Y. Goto). Volume II. Preface. International scientific committee. Local advisory committee. Local organising committee. Plates. Post-buckling of unilaterally constrained mild steel plates (S.T. Smith et al.). Shells. Buckling interaction strength of cylindrical steel shells under axial compression and torsion (H. Schmidt, T.A. Winterstetter). Abnormal behaviour of a steel silo caused by paddy rice storage (M.P. Luong). Buckling of cylindrical shells subjected to edge vertical deformation (M. Jonaidi, P. Ansourian). Transition of plastic buckling modes in cylindrical shells (Y. Goto et al.). Design and Construction. Prestressing and loading tests on full-scale roof truss of Shanghai Pudong International Airport terminal (Z. Xiangzhong et al.). Site measurement of vibration characteristics of Shanghai Jin Mao Tower (W. Shi et al.). Experimental assessment for aluminium alloy sections in glass curtain walls of Shanghai Jinmao Building (L. Tong et al.). Dynamics and Seismic Design. Transverse dynamic characteristic and seismic responses of large-scale tall-pier aqueduct (Y. Li). Dynamic performance of steel lightweight floors (M.M. Alikhail et al.). Prestressing. Long term analysis of externally prestressed composite beams (A.D. Asta et al.). Fatigue and Fracture. Experimental study on static and fatigue behaviour of steel-concrete preflex prestressed composite beams (K. Zhang et al.). Reliability analysis of draw bar of large-scale lock mitre gate (Z.G. Xu et al.). Fire Performance. The first code on fire safety of steel structures in China (G.Q. Li et al.). Optimization. Study on optimization of particular and multi-variable structures by wavelet analysis (L. Liu et al.). Analysis. Hoop stress reduction by using reinforced rivets in steel structures (K.T. Chau et al.). Soil Structure Interaction. Composite foundation of deep mixing piles for large steel oil tanks on soft ground (X. Xie et al.). Late Papers. Index of contributors. Keyword index.